One CM’s decision to reach out to a local community college is a win-win for all involved. Big C Lumber’s truss designer manager Dallas Austin says he has been “hearing other CMs talk about needing to get more involved with nearby schools” since he started attending SBCA Open Quarterly Meetings in 2015. With Southwest Michigan College (SMC) a mere mile and a half from their truss plant in Dowagiac, Michigan, there is a potential workforce literally in his backyard. The lumber side of Big C’s business had been attending career fairs at SMC for several years, but recently the company has stepped up their efforts and involved the truss plant as well. Dallas says conversations about workforce development with CMs from around the country “have been helpful in many ways.” Big C is now managing a flourishing relationship with SMC that has resulted in a pipeline of young, energetic new employees. 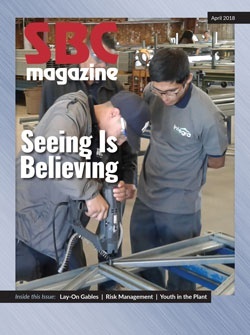 Last fall, Big C was a key player in SMC’s Saw Dust Day, one of the college’s primary outreach efforts to area high school students who are already involved in a construction trades program. With the ultimate goal of keeping these students interested in the trades, the event was designed to give students an opportunity to tour the campus, meet with SMC instructors and get a sense for the local companies that provide career prospects to SMC graduates. Big C Lumber’s president and chief executive officer, Bill Wallace, gave the keynote address and welcomed 180 high school students from four school districts to the November 3 event. With that in mind, as Sawdust Day participants moved through their SMC campus tour and the various exhibits provided by local companies, the Big C crew kept things fun and interactive. They divided each group of 15-20 high school students into two teams for truss assembly races to “make it a game, get them active and communicating.” Each group had to read a truss design drawing to understand how the truss went together and used “plates” Shawnee fashioned from OSB to complete their assembly. In a few short minutes, she says, the exercise “showed the students both what the designer does and what the production end of it looks like.” She says she’s had people contacting her about components ever since – at least one from every high school in attendance asking for more information.